QUESTION: I heard some other gardening radio program people saying that sweet peas are poisonous to eat? My sisters and I ate them all the time with no ill effects. What gives?!? pesticides. Collect young pods in early summer and peas slightly later. a dash of sugar. Cook until bright green and tender. Or, stir fry young pods with other vegetables . SOURCE: Crowhurst, A. The Weed Cookbook. Lancer Books, New York. 190 pp." With this being said, confusion is understandable when one reads from another source: "Although garden peas, (Pisum sativum) such as English peas, edible podded peas and snow peas are edible, sweet peas (Lathyrus odoratus) are poisonous - especially the flowers and seeds." This means that only the mature, hardened seed is poisonous if ingested. North America’s enchantment with sweet peas goes back more than a century. In the 1930’s box cars of sweet pea seeds were shipped from California producers to their customers east of the Rockies. The love of this fragrant garden climber was widespread in North America from farms of the plains to country gardens in the northeastern United States. English gardeners call sweet peas "the Queen of Annuals." These charming annuals are unique among garden flowers with their vivid colors, fragrance, and length of bloom in the garden. The flowers have an air of romance about them in both their scent and appearance. Sweet peas’ fragrance is sensuous, a captivating blend of honey and orange blossom, with an intensity that varies from one cultivar to another. The ruffled blooms look like little butterflies all aflutter. Sweet peas offer one of the widest color ranges in the plant kingdom, including crimson reds, navy blues, pastel lavenders, pinks, and the purest whites. These colors are found as solid colors, bicolors, and streaked or flaked flowers. Put it all together - fragrance and color - in a climbing plant with voluptuous clusters of flowers and it becomes obvious why sweet peas are such a favorite among gardeners and non-gardeners alike. The fact that they are long-lasting cut flowers is the icing on the cake. Several stems in a plain vase make a lovely country-style bouquet. Sweet peas can adapt to any garden style. They are excellent in a cutting garden, ensuring a bounty of flowers to enjoy indoors. The loose, billowing form of bush varieties makes them a natural in a cottage garden. Sweet peas can take on a more formal or casual look when they are growing up a support. Give them a trellis or fence - white picket, post and rail, or even chain link - sweet peas have an informal panache. Yet, train them on a tuteur and they exhibit all the class necessary for any formal garden. Arbors and trellises - available in so many styles - are perfect foils for sweet peas’ adaptability. Finding the right season to grow sweet peas will enable any gardener to enjoy their scented blooms. Sweet peas can take frost as they develop. So in North America, gardeners can enjoy these bloomers from early spring onward. Ideally, gardeners want to take full advantage of spring color by sowing seed in the fall in southern states and early spring in northern regions. With protection from intense afternoon heat and proper mulching, the blooming season of sweet peas can be greatly extended. Interestingly, the origin of the sweet pea in the wild has been greatly disputed. The first written record appeared in 1695. Francisco Cupani, a member of the order of St. Francis, noted seeing sweet peas in Sicily. There is no documentation of whether the sighting was in the wild or in the botanical garden in the village of Misilmeri (near Palermo) that was under his charge. It was not until 1699 that Cupani passed on the seeds of the enticingly fragrant, small bicolor flowers (blue and purple) to Dr. Casper Commelin, a botanist at the medical school in Amsterdam. In 1701, Commelin published an article on sweet peas, which included the first botanical illustration. Historians presume that Cupani also sent seeds to Dr. Robert Uvedale - a teacher and aficionado of unusual and new plants - in Middlesex, England at the same time as he sent them to Amsterdam. This assumption is based on a herbarium specimen that Dr. Leonard Plukenet made in 1700, noting the plant’s origin as Dr. Uvedale’s garden. In 1901, Silas Cole, head gardener to the Earl of Spencer, found a natural mutation in the garden under his care, which he named Spencer’s. The Spencer type became very popular because of its ruffled standard (the upper petal) and long wing (lower petals) that resulted in larger, more flamboyant blooms. They were late flowering varieties, which did not matter when grown in the cool English climate. Spencer types were also improved for the number of flowers produced per stem and were thus called "multiflora." There are many Spencer sweet pea colors available for gardeners today. The Spencer flowers remain very popular in England and Europe. There are many American seed companies that contributed to the advancement of sweet peas. Three American bred varieties from the early twentieth century remain popular today and are still in commerce. They are the long vine 'Royal' separate colors and ‘Royal Family Mix,' the shorter vine 'Knee-Hi Mix' and the very compact 'Little Sweetheart Mix.' California breeding of sweet peas has focused on developing extremely early flowering and non-tendril types. Mr. Yosh Arimitsu of Bodger Seeds Ltd. selected a series of sweet peas to be extremely early under long day or short day growing conditions, to have flower stems longer than 17 inches, and to produce extra large flowers on stems with 5 to 7 flowers. There are numerous improved qualities in the 'Elegance' series bred by Bodger Seeds Ltd. There has also been work done in non-tendril sweet peas. Typically, sweet peas have two leaves and two tendrils that cling and assist vines as they climb toward the sky. In non-tendril lines, the tendrils develop into true leaves and, thus, plants have four leaves per stem. Non-tendril varieties have shorter vines and are excellent for bedding use. Mr. David Lemon did the original non-tendril work at Denholm Seeds with the creation of 'Snoopea Mix' and later at Bodger Seeds with 'Explorer Mix,' winner of the RHS Award of Garden Merit. Compact container sweet peas have a long history. 'Cupid' varieties were popular in the early 1900’s and, at one time, greater than 30 varieties were available. With the growth of interest in container gardening, 'Cupid' lines have again become favorites of North American gardeners. ‘Cupids’ can be grown in window boxes, hanging baskets and containers. In recent years, New Zealand has also been a source of new sweet pea varieties, especially the breeding of Dr. Keith Hammett. He made great strides in the development of new color patterns, short day flowering, and a focus on fragrance. 'Streamers Mix' and 'Saltwater Taffy' are Hammett's creations containing all striped varieties in a single mix. 'Streamers Mix' is composed of many striped varieties, including chocolate/white, blue/white, orange/white, red/white stripes and shades between. There is a great deal of variation in the fragrance and intensity of smell in sweet peas. Since the odor that our noses detect is from a complex combination of volatile chemicals produced within the flowers, the strength of fragrance of a sweet pea variety can change due to a number of factors, such as rain, high temperatures, time of day and the age of the flower. The moniker, "sweet pea," was supposedly first used by the poet Keats in the early 1800s. 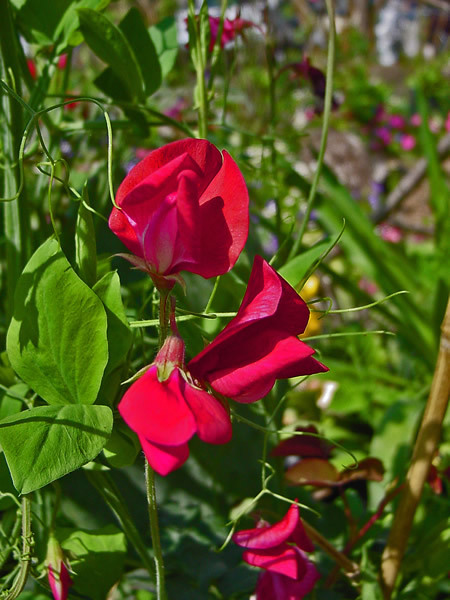 Both English and North Americans use the common name, "sweet pea." This text has focused on Lathyrus odoratus, common name sweet pea, but there are a number of other Lathyrus species worth mentioning. They include the perennial Lathyrus latifolius, available in four colors and a mix. This cold hardy perennial is suitable to USDA temperature Zone 5. Lathyrus sativus produces lovely small gentian blue flowers, while Lathyrus chloranthus has yellow flowers. This last species has been used, thus far unsuccessfully, in inter-species breeding attempts to bring the elusive yellow flower into the commercial L. odoratus. All three of these species mentioned above are commercially available in North America. Within the genus Lathyrus, there are 110 species and innumerable cultivars. In broad terms, the genus is commonly known as vetchling or wild pea. It is in the Leguminosae (a.k.a. Fabaceae) or Legume family. Other legumes include garden peas, acacia, beans, mimosa, redbud, soybeans, wisteria, and clover. With the growing interest in edible flowers, it is very important to be specific with the name. Although garden peas, (Pisum sativum) such as English peas, edible podded peas and snow peas are edible, sweet peas (Lathyrus odoratus) are poisonous - especially the flowers and seeds. There are four ways to classify sweet peas. They are habit, flower form, fragrance, or day length response. Plant habit can be climbing; tendrils wind around a support and can grow 6 to 10 feet depending upon the growing conditions and cultivar. The plant habit can be compact reaching only 8 to 24 inches tall and needing no support. Avid gardeners select the site first, and then determine the best variety with the desired habit for that site or container. 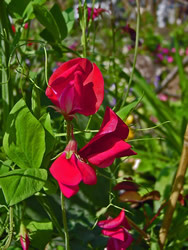 The sweet pea flower form can be single, double, or semi-double. The flower diagram shows the anatomical names of the flower parts. The flowers can be fragrant. If this is important, look for those that are labeled fragrant. Many plants initiate buds or flowers under certain day length. These are called short day or long day flowering plants. Most sweet pea cultivars need lengthening days to initiate buds and bloom. This means growing sweet pea plants after March 21 as day length increases. In the southern regions of North America, sowing sweet peas in the fall requires cultivars that are "short day flowering" due to the shorter day length of fall and winter. There are cultivars that fit this cultural requirement such as 'Elegance' series. Sweet peas are one of the easiest flowering annuals to start from seed. Sweet peas are commonly direct seeded in the garden. Give them a site with full to partial sun and deep, rich, loamy, moist but well-drained soil. Add plenty of organic matter (compost, well-rotted manure, leaf mold, or humus) to enrich the soil and make it more friable. Sweet peas are most successful when they are started at times with cooler temperatures. Each region has its own unique "season" for growing sweet peas. In western North America, sweet pea seeds should be sown from August forward to maximize winter and spring flowering. Although sweet peas can be killed back by hard freezes, they are reasonably cold hardy and can take frost without much damage to plants. Cooler night temperatures extend the enjoyment of sweet pea flowers in the west into the summer months. In the drier plains states, sweet peas can be started early indoors for transplanting or sown directly after the harshest weather has passed. Cut flower growers in Colorado have successfully grown sweet peas through high summer temperatures by mulching heavily as plants mature and weather heats up. In the south, sow seed in November or December for early spring fresh cut flowers. In the mid-west and northeast non-coastal areas, sow seed indoors in February and transplant into the garden when the ground thaws. Alternatively, seed can be sown directly into prepared garden soil in April. Finally, the coastal areas of the northeast are excellent areas to grow sweet peas for spring use. Sweet peas will need about 50 days of cool temperatures (under 60º F) to bloom gloriously in your garden. Sweet pea seed has a hard, water insoluble seed coat. There is no evidence that soaking sweet peas will increase germination. Nicking the outside coating of a sweet pea seed will allow rapid hydration of seeds and does both speed and increase germination. Nicking can be easily accomplished by using a nail clipper to score the sweet pea seed coat. Sweet pea seed will germinate in soil at temperatures of 55º to 65º F or 13º to 18º C.
Plant seeds in holes that are about two inches (two knuckles) deep. Drop two to four seeds per hole, with holes spaced four to six inches apart. Water thoroughly and keep soil moist until seeds have sprouted. Expect germination in about 10 to 21 days. Once the seedlings are growing, water regularly to promote strong, healthy growth. When the seedlings are three to four inches high, thin them out, leaving the most vigorous-looking plants four to six inches apart. Sowing seeds each week over several weeks will further extend the time you get to enjoy your sweet peas. Grow them in peat pots or four-inch plastic pots filled with a soil free seed-starting mix. Sow two or three seeds per pot - pushing each an inch down into the potting mix. Cover with mix, water, and put the pots in a cool, dark place. After about 10 days, keep an eye out for new shoots emerging above the soil. At that point, bring the plants out into the light. Keep them in a cool place (below 55°F. ); if they are coddled in a warm room, they won’t be tough enough to transplant outdoors without a lengthy hardening off period. When the seedlings have two sets of real leaves, thin to one plant per pot. Transplant into the garden about a month before the last frost date, as soon as the soil is workable - the shoots are tough and won’t be bothered by light frost. Allow 6 inches between climbing varieties, 12 inches between dwarf bushy types. When planting tall, long vine sweet peas, it’s best to place the stake or support in the ground at the same time as the seed or transplants to avoid damaging the roots. Trellises are the most common supports, yet there are other climbing options. Bird netting strung between two stakes, string, twine, or fishing line hung from the top of a split rail fence, a bamboo teepee, brush stakes - all are good verticals for sweet peas to climb. Unless the support is up against a wall, sow seeds on all sides, producing an eye-catching array of blooms that can be seen from all directions. Once the plants have been thinned, mulch them well; a four- to six-inch layer of organic mulch will keep the roots cool and extend the growing season. Do not over fertilize or you’ll wind up with very deep green leaves but few flowers. A balanced 20-20-20 slow release fertilizer blended into the soil at planting time works fine for the initial plant development. Alternatively, organic fertilizers are also excellent for sweet peas. Additional mulching with composted manure will help retain soil moisture and provide nutrients for strong plant growth and flowering. If blooms are not cut regularly, deadhead the plant as soon as flowers fade. Allowing the plant to produce seedpods will reduce overall flower production. Removing spent blooms will ensure more blooms. The first challenge for sweet peas, like other direct-sown seeds, is to avoid being plucked out of the ground by voracious birds, mice, squirrels, and other critters. As seedlings, sweet peas are vulnerable to birds, slugs, and snails, especially if fall-planted in a warm climate. Preventative measures often deter a problem before it has a chance to get started. Follow these guidelines for healthier plants. Plant sweet peas in an area that gets good air circulation. Water early in the day so the leaves are dry by nightfall; wet leaves are a magnet for fungus. Think of sweet peas like food crops. Rotate planting areas so that the sweet peas are grown in the same space once every four years. Don’t grow sweet peas where other legumes are growing or grew last year. Legumes include garden peas, beans of all types, peanuts, and clover. You may find sweet peas sold as plants particularly at some specialty nurseries or garden centers. There may be ready-made container plantings of sweet peas - an instant garden. Sweet peas need tender care when transplanted, so look for plants in individual earth friendly pots or peat pots. The larger the pot, the better. Right before planting, snip off any flowers or flower buds. This is the time to get the roots well established so they can support the growing plant’s needs. Even though you sacrifice early blooms, you’ll be rewarded with bigger plants with an abundance of larger flowers. Plant into prepared garden soil or a container. With transplants, it’s even more important to plant the support before digging the plant in to keep the precious roots out of harm’s way. Try to keep the root ball together. Plant it at the same depth as it was originally growing. Lightly firm the soil around it and water. Wait a week to ten days before mulching. Be sure to keep the mulch at least an inch away from the stem of the plant until plants are well established. Otherwise you could smother the stem or be likely to encourage insects, pests, and diseases. When the first flowers appear, start cutting flowering stems for indoor bouquets. In addition to adding the sweet perfume in the house, you’re encouraging the plant to produce more flowers. Cut stems every other day, early in the morning when they are the freshest. For climbing varieties, thinning lateral shoots that start at the base of leaves will reduce vegetative growth, increase flower production, and encourage better air circulation around the plant. The stems will look full when you first arrange them and the remaining buds will open as the first blooms fade. Be sure to remove any leaves that are below water level in the vase. A bouquet of sweet peas can easily last a week indoors if you cut off 1/4 to ½ inch at the base of each stem and change the water daily. This material is reprinted courtesy of The National Garden Bureau. Cathy Wilkinson Barash is the author of this fact sheet.